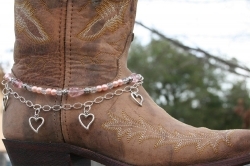 Boot Candy Crystals, Pearls and Hearts Boot Accessories, Crystal tear drop beads surrounded by shimmering glass pearls and sparkling clear Czech crystals. The accent silver plated chain holds 4 Silver plated Heart charms. Adjustable to fit your cowboy boots, your fashion boots and your winter boots, too! Made in the USA. Length: 14.25" to 15.75"